2018-19 - Online Registration and Payment! Please click the "Register Now" button to visit our new online registration portal. A new window will open and take you to our online registration service provided by Uplifter Inc.
Once on the registration portal you will need to create a account and add your child(ren) as participants. From there you can select your programs and complete your payment online. In an effort to make this process easier, we have arranged with the City of Owen Sound to collect payment for Non-Resident cards along with your program registration. Participants still have the option of purchasing a Non-Resident Card directly from the City by visiting or calling City Hall (Mon-Fri 8am – 4pm | 519-376-1440). Proof of purchase must be forwarded to OSSC. Meaford, Chatsworth, Saugeen Shores and all other Municipalities – Please choose “Non-Resident Fee – Other Municipalities”. 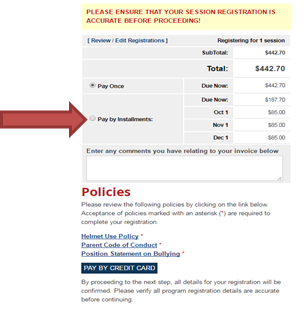 You will be charged $41.25 or 25% of the fee ($167). The Owen Sound Skating Club will contribute the remaining 75% of the fee to the City on your behalf. Please note, STARSkate participants must register for a minimum of 2 days/week in order to qualify for the non-resident fee subsidy. Follow the link on the "Register Now" Button above. The system will require that you create a “family” login – one universal login for all skaters in your family. From there, you add your participants and select the programs. Once you’ve selected your programs you will see your items appear in the shopping cart. Follow the prompts to complete the online checkout. We are able to accept Mastercard and Visa. Yes. You may pay skating fees over 4 installments. As in the past, your Skate Canada Fee, Fundraising Fee and ¼ of the program fee will be payable at the time of registration. Your credit card will be automatically charged for the remaining ¾ of the program fee on October 1, November 1 and December 1, 2017. To pay by installments, change the selection from “Pay Once” to “Pay by Installments” on the checkout screen and follow the prompts. We will once again be running the Skater’s Dream Draw this year with cash prizes of $1000, $500 and $250 to be drawn in February 2018. Your Fundraising Fee purchases you a book of draw tickets that you may then sell to recover your costs. Any money you collect from the sale of tickets is yours to keep as you have paid for the tickets up front. Ticket books will be ready for pick-up at the rink on the first night of skating. With the draw happening in February, you will have ample time to sell those tickets! Families with 3 or more children registered in programs will receive the 3rd and subsequent registrations at half-price! In order to qualify for the discount, all 3 (or more) registrations must be on the same invoice. The discount will be applied to the lowest priced programs.